Rome’s Involtini di Manzo (Beef Rolls) from Tasting Rome. This will be my last post before I enter into a blissful week of tropical summer where my hardest decisions will be whether I order a cocktail in a coconut or pineapple. I'm going on holidays!!! And I'm so excited. It's been 5 years since I've been on a proper 'hop-on-a-plane' holiday and the first time in 9 years going overseas with my other half. Thailand here we come baby!! But before I disappear off cyber space for the next week I thought I'd share the dinner I made on Saturday night when the big chill decided to hit the east coast of Australia. My previous post must of jinxed it and Mother Nature thought 'I'll show her!' and let Jack Frost go mental on us all. So to warm our little footsies a hearty, carb filled, slow cooked dinner was on the cards with a glass of wine (or a bottle or two) for Saturday night. 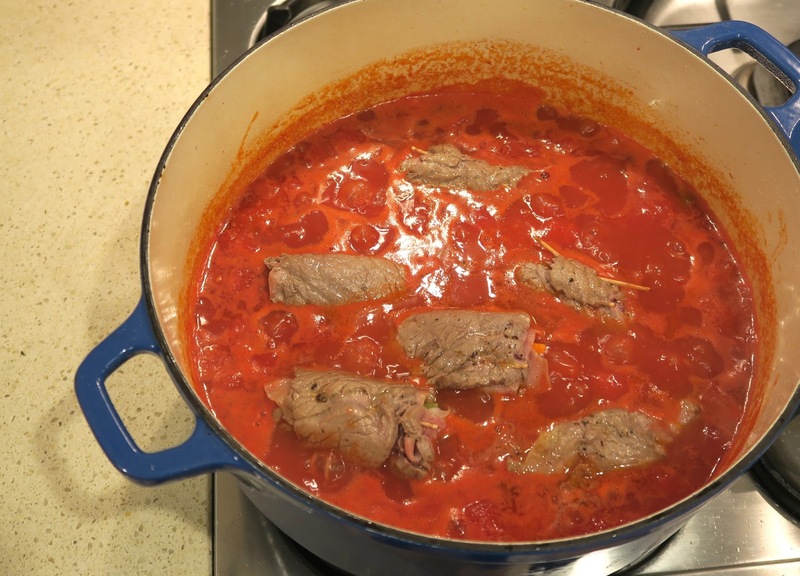 Earlier in the week I read a blog post from 'Dinner: A Love Story' where guest blogger Katie Parla shared a recipe for Rome’s Involtini di Manzo (Beef Rolls) from her new book Tasting Rome who she wrote with Kristina Gill - I cannot wait to get my hands on a copy when I'm back. As soon as I read the post, I knew I had to make it this weekend, especially if it was going to be as cold as they were predicting. And it was. Jack Frost did not hold back although he didn't quite bring the snow to Sydney unfortunately. Now I could tell you that the entire dinner went smoothly and I had no hiccups but then my nose would grow and quickly poke the laptop screen in front of me as I'd be telling you a fib. I blame the fact that there was a cheese plater and a bottle of really delicious bubbles that made me (kind of) forget about the involtino in tomato sauce blipping away that needed checking now and again to make sure it hadn't reduced too much or caught on the bottom. It was my nose that picked up on it before dinner ended up a total disaster. I could suddenly smell something and I instantly knew what it was, I've done this before you see. I had a 'Julie and Julia' moment when Julie Powell burns the stew... no no no no! I walked very quickly (I didn't want to cause alarm by running despite what instinct told me to do) over to the pot and lifted the lid. I had caught it just in time. I turned the heat off, didn't stir it and scooped the involtini out of the pan and the parts of the thick sauce which hadn't caught to the bottom of the pan yet and put it all in a new pot with about a cup of boiling water to save dinner. It worked...thank goodness!! Dinner was saved and even with my hiccup it tasted pretty darn delicious. The recipe says 'cook once, eat twice' but I decided to serve the entire dish with spaghetti and serve it all together with the involtini sliced on top. It was delicious and the leftovers on Sunday night were just as good, if not even better. 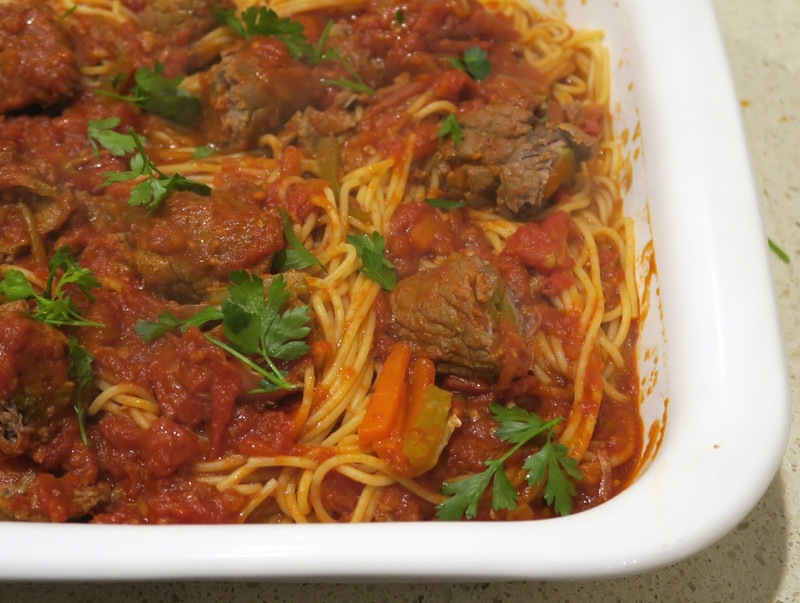 I know I will make this again and again, I love pasta with tomato based sauces and any kind of slow cooked beef. Yum. It does take and hour and a half on the stove and YES it needs to be checked now and again to make sure it hasn't reduced too much or caught on the bottom of your pot. But then maybe don't try and consume half a bottle of bubbles and a cheese plate while cooking or at least set a timer if good wine and cheese distracts you as much as it does me. It was a great way to spend a chilly Saturday night... great food and great company now bring on the cocktails and sun lounges. Laters! - Lay the slices of beef flat on a chopping board and season with salt on both sides. Place 1 piece of prosciutto over each slice of meat, followed by 3 or 4 sticks each of carrot and celery at one short end of the meat. Roll the meat around the vegetables, forming a medium-tight involtino (roll). Using a couple of toothpicks inserted flush with the meat to keep the roll closed (or you can use kitchen twine). - Heat the olive oil in a medium to small pot over medium heat. Once the oil is hot, add the involtini and brown on all sides, about 5 minutes. Remove the rolls from the pan and set aside. - Add the crushed garlic to the same pan and cook, stirring constantly until it just turns golden, about 2 minutes. Stir in the canned tomatoes and wine and cook until the alcohol aroma dissipates, about a minute or two. - When the sauce begins to simmer, add the involtini back to the pan. 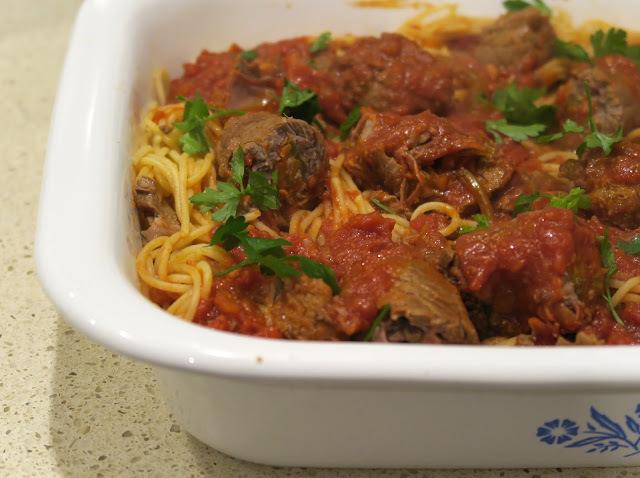 The meat should be mostly covered by the tomato sauce. Cook, covered, until the meat is fork-tender, about 1½ hours, checking occasionally (very important!!) to be sure the meat is at least two-thirds submerged and adding water if necessary. 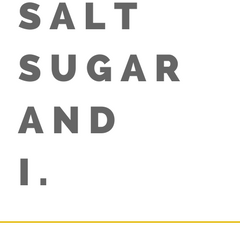 - Season with salt and pepper. Serve immediately with spaghetti (like I did) or separately serving the sauce with pasta as an entree and the Involtini as a mail. Or allow the dish to rest in the refrigerator for up to three days to allow the flavours to develop - it's even better the next day! Blondies - a cross between a chocolate chip cookie and a brownie. Jack Frost has taken leave this winter in Sydney. I haven't had any icy mornings or crunchy grass and winter has been here for officially 3 weeks now. I think the weather is drunk. Crazy storms one weekend (like swimming pools falling in the ocean) and then humid the next. Where is winter?? Jack Frost where are you?? Since Mr Frost has taken leave I've not had any desire to cook wintery comfort food yet. Instead all I've thought about it blondies. What are blondies? They are like a poor mans brownie since they have a whole bunch less chocolate in them but still just as good or more traditionally, a vanilla version of brownies. They go perfect with a morning coffee, delicious heated up so the chocolate chunks go molten with a scoop of vanilla ice cream (in front of the fire - if you're lucky enough to get cold weather to warrant a fire) or if your a cookies and cold milk kind of foodie then these will blow your mind. 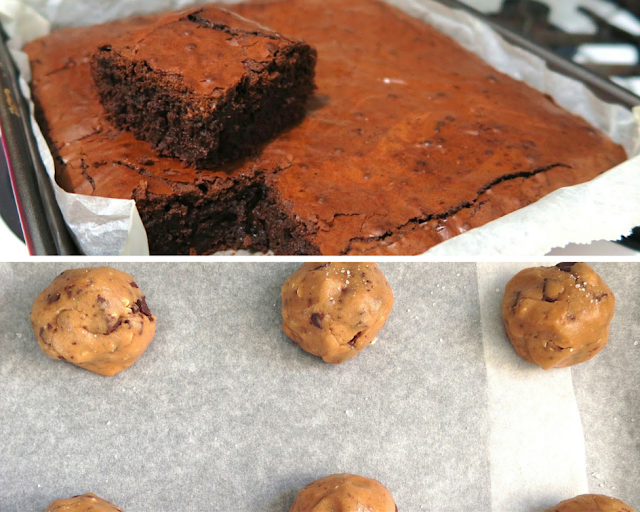 To me they are a mixture between a really great chocolate chip cookie and a brownie. Have I convinced you that you need these? I need them. If only there was more hours in the day and we were born with two stomachs, I could cook and eat everything I ever want in a day. Instead, since it's the shortest day of the year, the winter solstice, why not do some night time baking and enjoy a molten blondie with some vanilla ice cream on the couch snuggled up tonight. Fingers crossed it gets a little frosty in Sydney! *photo fail but since it's like a cross between a brownie and chocolate chip cookie - thought this was appropriate. Or click here to get your fix of 'blondie' images. - Preheat oven to 350F and move trays to bottom wrack. Spread macadamia nuts onto large baking tray and bake for about 10-15 minutes. Transfer nuts to chopping board to cool, roughly chop and set aside. - While the nuts are toasting, line a 13 x 9 inch baking pan/tin with baking paper, making sure the edges come up a little higher so you can lift the blondie out once baked. - Whisk flour, baking powder and salt together in a medium bowl and set aside. - Whisk melter butter and brown sugar together in a medium bowl until combined. Add eggs and vanilla and mix well. Fold in the dry ingredients using a rubber spatular, until just combined but do not over mix. Fold through chocolate and nuts then pour into prepared tin and smooth over the top making sure the batter is level on top. - Bake for about 22-25 minutes, until top is shiny, cracked and lightly brown. Do not over bake! Cool on a wire wrack in the baking tin until room temperature (if you can last that long!). Remove from pan by using the overhanging baking paper and cut into squares and enjoy! Homemade Monte Carlos + I heart Hunter Valley. *warning. this biscuit recipe is so good. stop what you are doing and just skip to the recipe. The weekend before last, I went away for a girls weekend to the Hunter Valley. It was filled with local wine, delicious and large amounts of cheese and of course, great company. Some of us drove down on the Friday listening to RnB Friday's, all on a giddy high from having the day off work... we were free!! (until Monday). And! we were heading to a farm that had a real fire place with logs of wood and chickens that laid eggs. To say we were slightly excited was an understatement. I was a little too excited the night before and morning of and made two containers of baked goodies. Homemade Monte Carlos and Food 52's famous Blondies. I couldn't decide which one so ended up making both, I didn't think anyone would complain. After we all survived the grocery shop and after everyone was still best of friends we arrived at our little farm house for the weekend and were greeted by cows and an over-friendly cat called 'Smudge'. I say over-friendly because he had a plan which we realised quite quickly; he was trying to butter us up to let him inside by the fire but after rolling in cow patties, eating a bird on our door step and strict instructions from the owners it best he stay outside. While it was still light we went to visit the chickens AND a mama cow and her calf. Ahhhhh we all squealed, you could tell we were not from the country. When the farm dogs tried to round us up like wondering cows we decided it was time to retreat inside and warm ourselves up with a cuppa and a Monte Carlo before we cracked open the champagne and cheese platter. The first challenge of the weekend was not who could finish their tea first and start on the bubbles but to light the fire and keep it going. We had wood, we had kindling and we had a match. Yes. One match. Luckily we had a ex-Scout with us and a couple of tea-lights to help. *i thought i told you to skip straight to the recipe! The next morning we were up at sparrows fart to get ready for our early shuttle bus pick-up. Over cooked eggs (I'm useless at cooking eggs), buttered toast, milky tea, face on, hair done and the realisation of my jacket still sitting at home but I was ready to start tasting what the Hunter Valley was made of. My favourites were definitely Ernest Hill and Draytons, they were also the first two we went to so that could also why I remember the wines better then the rest. The last stop was the Vodka Distillery which was more fun for the novelty of flavoured shots in test tubes then exactly tasty. The chilli vodka blew my head off! It was home after that to start our fire again and warm our feet, luckily our late addition to the girls weekend brought more matches with her late on Friday night. Farm/life saver! Being back to the usual grind of Monday to Friday now for 2 weeks, I cannot wait to escape again this long weekend. But if I can recommend anything, it's to make these Monte Carlo Biscuits this weekend. They are seriously good. #freakinamazing #sososodelicious #betterthentheoriginal #sorryarrnotts #homemadewinseverytime #yumyumyumyumyum #iusedhomemadejam #bestbiscuitever #justdoit #makethemnow #whatareyouwaitingfor!? so.... why are you still sitting reading this?? If your not an Aussie and weren't brought up licking the centre out of these chewy jam, cream filled biscuits then you probably have no clue what I'm talking about. The Monte Carlo is an iconic Australian biscuit made by Arnotts which has been around since 1926 and in my opinion, this homemade version is going to change your biscuit making/eating life forever. The honey, golden syrup and coconut in the shortbread gives it a really great caramelised, nutty flavour while the sweet sugary buttercream on the inside is tongue tingling against the tart raspberry jam. I used my homemade raspberry jam that I made a few weeks ago so I am slightly bias and probably love them even more because of it but you could use a store bought jam and still make one of the best biscuits you'll ever make. They go perfect with a cuppa or even a glass of bubbles. adapted from Paul West, River Cottage Australia. - Preheat oven to 175C/350F and line as many baking trays as your have with baking paper. - Cream butter and sugar together until pale and fluffy. Add the egg, honey and golden syrup and beat until really well combined. - In a separate bowl mix together flour and baking powder (really well) using a whisk. Add the coconut and then combine all the dry ingredients with the butter mixture stirring until everything is evenly combined and a soft dough forms. - Pinch off about a teaspoon (roughly 10g) of dough at a time and roll into a smooth ball. Place on your lined baking tray about 3 inches apart. When you have filled one tray, press each ball down to flatten it then using a wet (must be wet!) dessert spoon smooth over the top, flattening it more and forming it into an oval shape, about 5mm thick. Using a fork, rough up the tops to give them a more traditional 'Monte Carlo' biscuit look. - Once you have done as many trays you have/fit in your oven, you can start baking. - These biscuits will take about 7-10 minutes, depending on your oven so keep an eye on your first tray to give you a guide for baking. They should come out of the oven golden brown and smelling of the golden syrup and honey. - Allow to cool on trays for about 5 minutes then remove onto wire racks to cool completely. - When all your biscuits are baked, start on your buttercream filling. - Cream butter until pale a creamy then add your icing mixture then your vanilla and milk. Beat on high until the buttercream is pale and fluffy. - You can now start to fill. - No one is perfect so not all your biscuits are going to be the same size. Match them up in pairs as best you can. The first way, spread about a teaspoon of buttercream onto one side of a paired biscuit and spread about half a teaspoon of jam on the other and press gently sandwiching them together. Or the second way, put your buttercream into a small piping bag or sandwich bag and cut about 5mm of the tip/corner off. Pipe around the edge of one of your paired biscuits and a swirl in the centre. Spoon half a teaspoon of jam on the inside of your buttercream piping edge and on top of the swirl and press gently sandwiching them together.